Pillows are available with *Made in USA* Down Alternative Hypoallergenic POLYFILL INSERT, ***OR*** as COVER ONLY, NO INSERT. They Include Invisible Zipper enclosure for a Tailored Look. All seams are overlocked and stitched for a professional finish. Back fabric color: gray. Dry Clean Only. 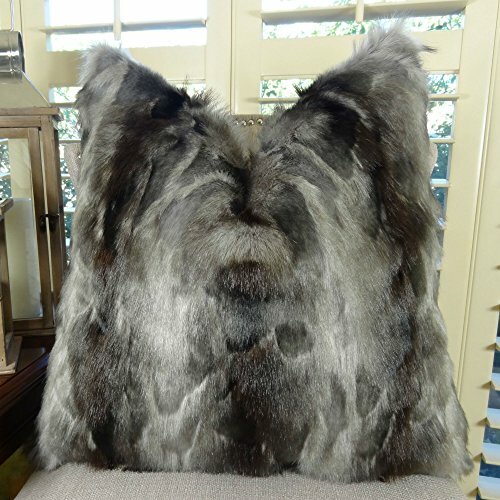 This stunning Fox faux fur throw pillow has high/medium pile in gray and charcoal fur and is incredibly soft and plush with super soft gray microfiber back fabric.. Please note: On certain fabrics & cowhides pattern placement may vary from depicted images. Please Note: Our pillows/throws/bedspreads are custom handmade per your order; Returns will incur a 15% re-stocking fee, unless exchanged for equal or higher value. For questions, please contact us at info@PillowsAndDecor.com or send a message via Amazon. If you have any questions about this product by Thomas Collection, contact us by completing and submitting the form below. If you are looking for a specif part number, please include it with your message.